Harford and Cecil County's Trusted and Reliable Plumbing Company. 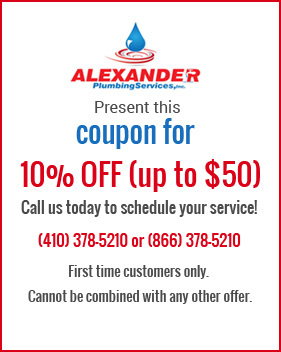 Welcome to Alexander Plumbing Services! We are a Cecil County, Maryland plumbing service located in Conowingo, MD. Whether you’re looking for emergency plumbing repair work, commercial or residential water treatment service, or plumbing for new construction or remodeling, we will get the job done quickly, efficiently, and correctly. Alexander Plumbing Services, Inc. is owned and operated by Mark Alexander, a master plumber and gas fitter with 29 years of experience. We have a professional staff who will take care of all of your plumbing needs for a fair price. We service residents and businesses in Cecil County, Maryland (including Elkton, North East, Perryville, Rising Sun, Port Deposit); Harford County, MD (including Bel Air, Aberdeen, Havre de Grace); northern and eastern Baltimore County, MD; Lower York and Lancaster PA Counties including parts of Chester Co PA; and surrounding areas.